1 of 4 Microwave noodles for 1 minute; set aside. 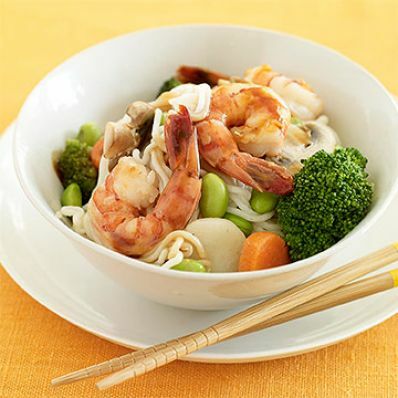 Place shrimp in a small bowl and toss with 2 tablespoons teriyaki sauce; set aside. 2 of 4 Place mixed vegetables and edamame in a large nonstick skillet with water. Cover and cook, stirring occasionally, over medium-high heat for 7 minutes or until cooked through. 3 of 4 Stir shrimp into vegetable mixture; cover and cook 4 to 5 minutes or until shrimp is pink and cooked through. 4 of 4 Stir together remaining 1 tablespoon teriyaki sauce and the cornstarch, then stir into the mixture in the skillet until thickened. Gently stir noodles into skillet and cook until warmed through.